I admit, I have an affinity for obscure Colorado religious records. While most collectors shun the genre, I have become a safe haven for any and all. And why not? 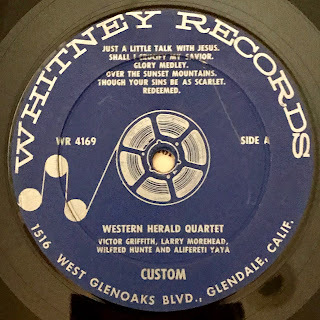 I mean, church-goer, or not, some of these recordings are pretty damn, er I mean, darn good. Take for instance the on-point harmonies of the Western Heralds Quartette. What? You have never heard of the Western Heralds Quartette? Let's remedy that, right now. In 1956, the Institute decided to diversify its classroom attendance, and launched a foreign exchange missionary program. Students, from different parts of the world, were offered scholarships to attend the school. This instantly changed the look of the campus, with students of different nationalities bringing their own international flavor to the little Bible college. Alifereti Yaya arrived from Fiji. Victor Griffith and Wilfred Hunte came from Barbados - and all three brought with them a love of not only the holy word, but also the holy song. 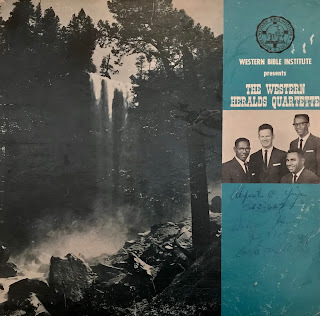 They soon teamed up with Larry Morehead - who came all the way from...Denver - and began singing four-part harmonies in the dorms. Somehow the group caught the ear of higher-ups at the school, who thought their talents could serve as a promotional opportunity. 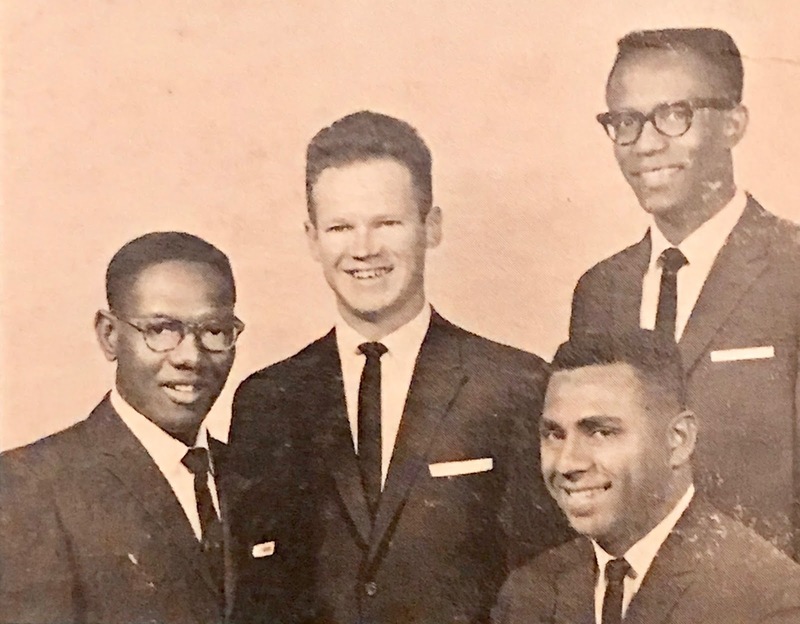 In 1961 they headed to the recording studio. 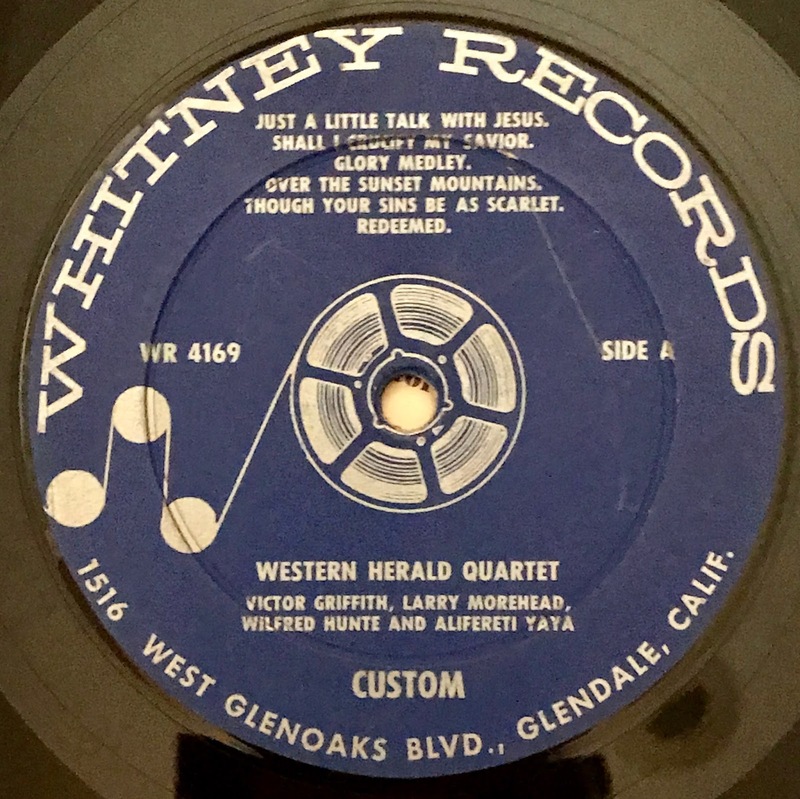 Released on the custom Whitney Records label, the Western Heralds Quartette is accompanied by Marie Shuler on organ and Phil Shuler on bass, while Larry Morehead handles guitar. Listen to a sample of "Jericho Road"